I think I first learned about iFaketext on Pinterest. iFaketext is a web-based application that allows users to create a fake text message exchange on an iPhone (side note - they also have a Siri simulator, which I haven't tried but definitely has language class potential as well). I first started using this to create reading exercises for assessments (and still do), but last year I created a task where students created their own conversation. As you can see from the examples, students had just moved past learning greetings and were learning to ask questions about nationalities and who they know. Since we were using a texting platform, I used this as an opportunity to teach some texting lingo. This came right on the heels of learning about formal and informal language with the greetings, so we added a few terms to the informal language students had already learned. I thought this made the task a little more "authentic." 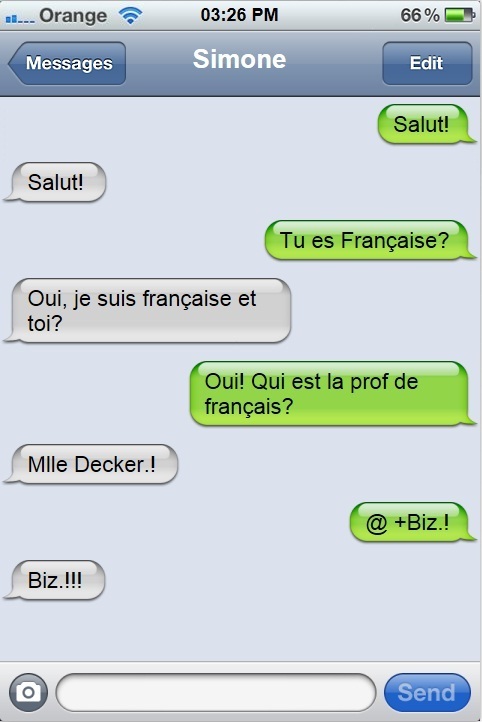 I gave them terms such as biz (short for bisous, which they had just learned), @+ (for à plus), bjr, mdr (a very popular one that stuck for the rest of the year - any time something funny happened in class, usually someone would say "MDR"). Another little culture bit is that you can choose what carrier is displayed at the top, so I asked students to pick either the French one (Orange) or the Canadian one (Rogers), as these were the two francophone options. Although I liked using the texting lingo, I didn't want the whole task to be about texting vocabulary. I gave students a list of words they could use (some may say this stifles creativity but in my experience working with novice students, I think it helped them focus better on the task and not get carried away with trying to say things beyond their capabilities). I left "ça va" and "très bien" off the list to avoid that taking up half the space on the assignment. Students had one class period (about 35 minutes after instructions from the previous day were recapped) to work on this task with a partner and submit it to me. Although at this point in the year the students' vocabulary was fairly limited, the students seemed to enjoy the task and liked the idea of using real French "slang." The one thing that is troublesome about iFaketext is that the students experienced some formatting difficulties with them on the school computers. Sometimes the accents would show up funny for them, but when I went back and looked at it on my computer (still at school), I could see the accents just fine. Students have different internet permissions than teachers in our school, so it's possible that that could have affected it, but I don't know how. Also, when the students went to preview their message and realized they needed to correct an error, they had to start all over again when they went back, as the site hadn't saved their information. In hindsight, this could have been solved by having the students draft their work in a word processing software, but at the time I thought there was also an issue with the accents, so I made a Microsoft Word template for some of the classes (see an example below). There are pluses and minuses to each method, but I think I'll try the website again next year. Obviously this task could be modified to suit just about any language or level. 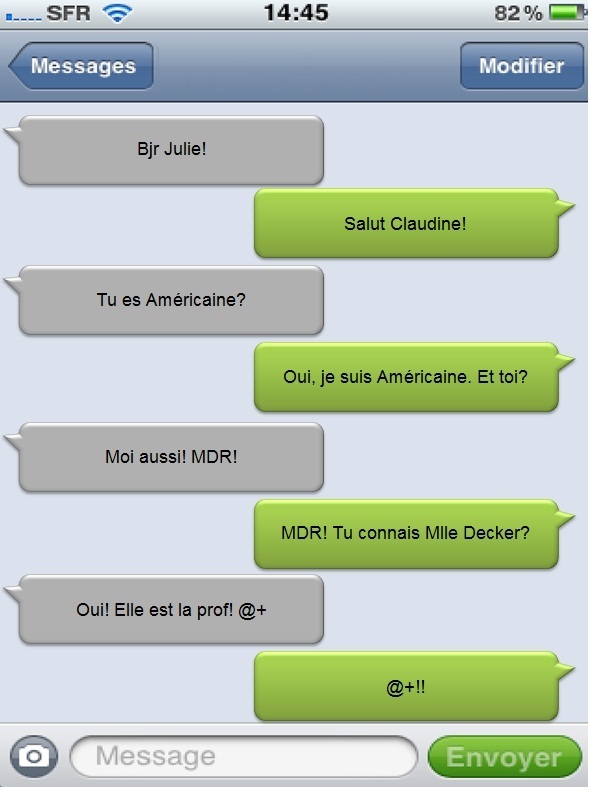 Although it's not truly authentic like texting with students in a francophone country would be, I think something as simple as changing the interface helps to make the idea of communication more exciting to students, and giving them real texting vocabulary encourages them to try texting each other in French...outside of class of course. I have had a number of students report that they often do this. Have any of you used iFakeText? Good job! The only problem I am having is with using the image solely. I was thinking of using iFakeText to display the instructions of what I want my students to do but there isn't an option to copy/paste; it only allows you to generate links for a blog or for emails. I'll have to just use it your way instead! Hi Samantha. I'm going to use this tomorrow! How did you get the iPhone heading on iFakeText in French... "modifier" l'heure française, and then on the bottom, "envoyer." I don't see that option on iFakeText. Thanks! I believe I made that template at the bottom of the page using a French iPhone image. It's not part of ifaketext, unfortunately.